When using control charts, users choose metrics to view. 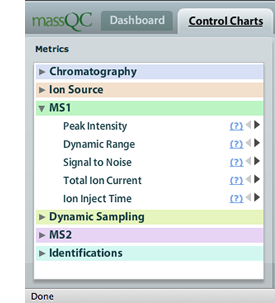 MassQC gathers together hundreds of LC-MS characteristics and compiles them into metrics. The metrics are a culmination of years of research in instrument performance by the National Institute of Standards and Technology (NIST). 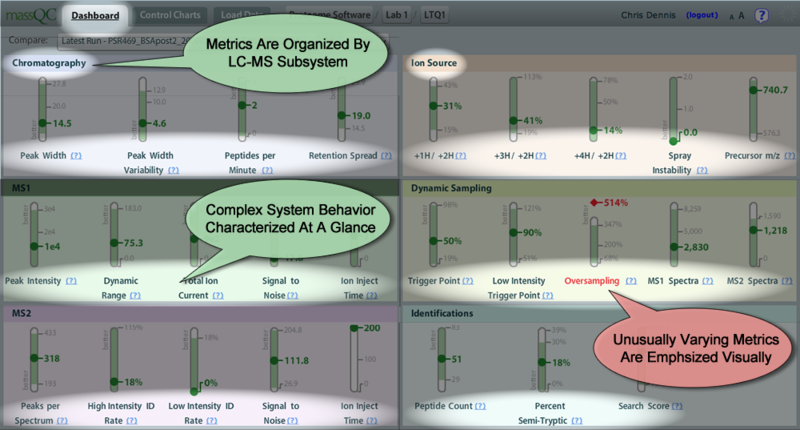 In place of intuition or a single checkpoint, mass spectrometrists can rely on MassQC's metrics to clearly portray the performance of their equipment. Trust the quick picture of a single calibration run and watch for drift using time-series analysis. Metrics connect to real-world problems. The best thing about MassQC's metrics is that they can be used for resolving issues. Together, the standards and the program detect variability factors. These factors can be reduced with intervention. MassQC can help determine when routine maintenance is required. It can also help determine if that maintenance was effective. It can give increased confidence to mass spectrometrists who are trying to expand the boundaries of measurement.